In Winter and early Spring your trees will be covered with Super fragrant blossom as an extra attraction. Fruits slowly swell, mature and ripen over a whole year or so. Grow outside in the Summer and bring indoors in Winter when tempratures below 5C. Deliciously juicy full-size fruits in the first season, and winter hardy to -5C. Thats right! 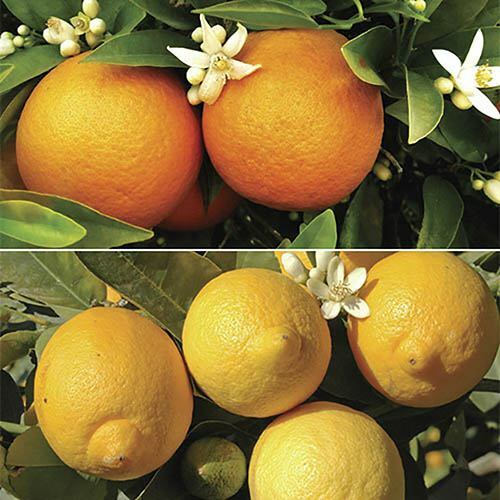 This pair of Orange and Lemon trees will grow and fruit perfectly in the UK. Packed full of vitamin C, theyre deliciously juicy and good for you too! And they smell simply divine the sweetly perfumed white flowers contrast beautifully against the deep green citrus-fragranced foliage. Lemon 'Eureka' - Hardy down to -5C! - Sweetly scented blossom in late Spring. - Full-size fruit from August onwards. - Perfect for drinks and cooking. Orange 'Navelina' - Hardy down to -5C! - Seedless and very juicy. - Enjoy your own freshly squeezed orange juice. - Packed full of Vitamin C.